President George W Bush has called on Congress to end a 27-year ban on drilling for oil in US coastal waters, to reduce dependence on imports. Mr Bush said existing restrictions on offshore drilling were "outdated and counter-productive". His move comes as US consumers are calling for action to tackle high oil prices that have pushed prices at the pump to more than $4 (£2) a gallon. US energy needs are set to be a key issue in November's presidential poll. Republican John McCain favours offshore oil drilling, whereas his Democratic rival, Barack Obama, opposes it. 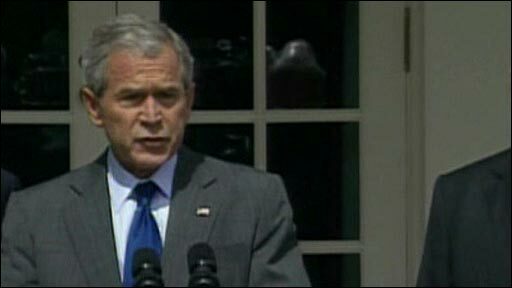 In a news conference at the White House, Mr Bush told Congress there was "no excuse for delay" in lifting the ban. "Families across the country are looking to Washington for a response," he said. Environmentalists have reacted with alarm to Mr Bush's call, arguing that off-shore drilling would take at least a decade to have any effect on oil supply and would exacerbate climate change. Since 1981, a congressional moratorium has prohibited oil and gas drilling along the east and west coasts and in the eastern Gulf of Mexico, an area accounting for some 80% of the US's Outer Continental Shelf. Mr Bush's father, George Bush, imposed a moratorium on coastal oil exploration in 1990. Since then offshore drilling and exploration have only been allowed in the Western and Central Gulf of Mexico regions plus parts of Alaska. The federal bans were enacted in part to protect tourism and lessen the chance of oil spills washing on to beaches. The Democrats, and some Republicans who represent coastal states, oppose ending the moratorium. "We are in this situation because of our dependence on traditional petroleum-based oil," said California Governor Arnold Schwarzenegger, a Republican. He advocated "new technologies and new fuel choices for consumers" instead. Mr Bush, who has repeatedly pushed for an end to the ban, has accused Democrats of using their control of Congress to undermine attempts to boost domestic oil production. 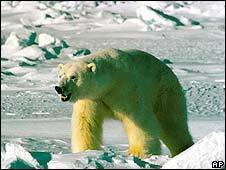 The president also renewed his call on Wednesday for the Arctic National Wildlife Refuge in Alaska to be opened up to drilling. "It's cynical to say that we can drill our way out of this mess," Athan Manuel, director of lands protection for the Sierra Club, told Reuters news agency. "The solution to $4 gas [petrol] is not off our coast." Kassie Siegel, climate programme director at the California-based Center for Biological Diversity, condemned the Bush offshore initiative. "This is the culmination of the failed Bush-Cheney energy policy of the last eight years," she told the BBC News website. "It would do absolutely nothing for petrol prices because it would take at least a decade to produce any oil and even if the oil did flow, there would be the greenhouse gases from the additional fossil fuel development." She points out that the US government recently calculated there was a 33-51% chance of a major spill in the lifetime of an offshore oil and gas lease in the Chukchi Sea off Alaska. Such a spill, defined as a release of 1,000 barrels or more from a platform or pipeline, could affect bowhead whales, polar bears and other wildlife. However, the government's environmental impact statement concluded that "an area affected by such a spill relative to the size of the Chukchi Sea decreases the likelihood that the resources would be widely contacted by the spill". Senator McCain, the Republicans' presumptive presidential candidate, is opposed to opening up Alaska and had previously backed the moratorium on drilling in coastal waters. But speaking in Houston on Tuesday, Mr McCain called for the ban to be lifted to help counter US dependence on foreign oil. "We must take control over our own energy future and become once again the master of our fate," he said. Mr McCain said the US had enormous energy reserves and was acquiring methods of using them in clean and responsible ways. Senator Obama dismissed Mr McCain's call as "political posturing". "His decision to completely change his position and tell a group of Houston oil executives exactly what they wanted to hear today was the same Washington politics that has prevented us from achieving energy independence for decades," Mr Obama said. He called for conservation and the search for alternative green energy supplies. Analysts say drilling for offshore oil and developing alternatives will both prove slow to reduce US dependence on imported oil.